On February 18, 2002, Constable Laura Ellis had just returned from maternity leave for her last shift with the Toronto Police Service before joining Durham police. She was the passenger in a police car when she and her partner responded to a call for a break-and-enter. They were heading into an intersection with the green light in their favour when the driver of a Toyota Camry made a right turn into the path of the oncoming police car. Constable Ellis' partner attempted to take evasive measure, however the cars collided. The impact sent the police car into two trees before it crashed into a hydro pole. Constable Ellis was taken to hospital where she was pronounced dead. 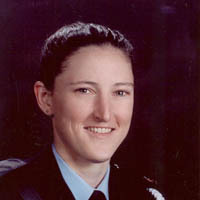 Constable Ellis was the first female Toronto Police officer to die in the line of duty.